Raul Anguiano, harmonic geometry, muralist and printmaker. Mario Orozco Rivera, muralist and easel. Miguel Condé, painter, draftsman and figurative recorder. Vladimir Cora, painter and sculptor, oil, acrylic and enamel. Pedro Coronel, painter, sculptor, draftsman and engraver abstract. Rafael Coronel oil, melancholy painting. Miguel Covarrubias, Art Deco cartoon. José Luis Cuevas, painter, sculptor. Gunther Gerzso, oil, pioneer of Mexican (Abstract Surrealism Expressionism). Jorge González Camarena, painter, sculptor and muralist. Saturnino drawing, oil painting, frieze at the Palace of Fine Arts in Mexico city. María Izquierdo, oil painting, surreal, muralist, first Mexican painter to exhibit in the US. Leonardo Nierman, painter and sculptor. Luis Nishizawa, artist (various techniques). Juan O’Gorman, mural (murals at UNAM, Mexico). Pablo O’Higgins, American-Mexican (SEP murals and the National School of Agriculture at Chapingo) muralist. José Clemente Orozco, mural (murals in the Palacio de Bellas Artes, Hospicio Cabañas). Alfredo Ramos Martínez, painter and muralist. Rivera, painter and muralist (National Preparatory School, Palace of Fine Arts, School of Agriculture at Chapingo). Federico Cantú, muralist, printmaker and sculptor. Leonora Carrington, painter and novelist of English origin. Francisco Toledo, painter, sculptor and ceramist. Alfredo Zalce, muralist, printmaker and sculptor. Gustavo Murueta painter, sculptor, draftsman and printmaker. Desiderio Hernández Xochitiotzin Tlaxcala muralist painter. The great Mexican muralists of the post-revolution developed, with the paint mural, the concept of “public art”, an art to be seen by Ias masses in major public buildings of the time, and could not be bought and transported easily elsewhere, as with easel painting. Just like many other parts in the world, Mexico has adopted some modern techniques like with the existence of street artists depicting popular paintings from Mexico throughout history or original content. Eliseo Garza Aguilar, painter and performance artist. Considered among the leading exponents of provocative and thoughtful art of the Third Millennium. In search of a critical response from viewers, combines his paintings in the performances with the theatrical histrionics. Emanuel Espintla, painter and performer. Considered among the leading exponents of Mexican naive art and Fridamania. Pilar Goutas, a painter who uses oil on amate support, strongly influenced by Pollock and Chinese calligraphy. Torres Rafael Correa he settled in Mexico in 2001 and joined the workshop of contemporary art, “The Moth” in Guadalajara, doing various art projects and scenographic. In Mexico works with painters, José Luis Malo, Rafael Sáenz, Edward Enhanced and sculptor Javier Malo. He participated in workshops recorded by the painter Margarita Pointelin. In 2003 he made a formation of Washi Zoo Kei with the Salvadoran master Addis Soriano. Enrique Pacheco, sculptor, painter, characterized by merge painting and sculpture with worldwide recognition. Pilar Pacheco Méndez, visual artist and sound. Daniel Lezama, visual artist. Works on all major formats oil. Born in 1968 to Mexican American parents. Roberto Cortazar, visual artist, painter. Rafael Cauduro, painter, sculptor, muralist. Omar Rodriguez-Graham, Painter. Born in Mexico City in 1978. Miguel Sanchez Lagrieta, Painter, visual artist. Gabriel Orozco, Painter, Sculptor Veracruz. 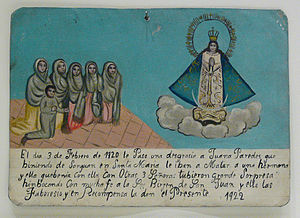 Ex-voto painting from the early 1920s honoring Our Lady of San Juan de los Lagos. Mexican handcrafts and folk art, called artesanía in Mexico, is a complex category of items made by hand or in small workshops for utilitarian, decorative, or other purposes. These include ceramics, wall hangings, certain types of paintings, and textiles. Like the more formal arts, artesanía has both indigenous and European roots and is considered a valued part of Mexico’s ethnic heritage. This linking among the arts and cultural identity was most strongly forged by the country’s political, intellectual, and artistic elite in the first half of the 20th century, after the Mexican Revolution. Artists such as Diego Rivera, Rufino Tamayo, and Frida Kahlo used artesanía as inspiration for a number of their murals and other works. Unlike the fine arts, artesanía is created by common people and those of indigenous heritage, who learn their craft through formal or informal apprenticeship. The linking of artesanía and Mexican identity continues through television, movies, and tourism promotion. Most of the artesanía produced in Mexico consists of ordinary things made for daily use. They are considered artistic because they contain decorative details or are painted in bright colors, or both. The bold use of colors in crafts and other constructions extends back to pre-Hispanic times. These were joined by other colors introduced by European and Asian contact, always in bold tones. Design motifs vary from purely indigenous to mostly European with other elements thrown in. Geometric designs connected to Mexico’s pre-Hispanic past are prevalent, and items made by the country’s remaining purely indigenous communities. Motifs from nature are popular, possibly more so than geometric patterns in both pre-Hispanic and European designs. They are especially prevalent in wall-hangings and ceramics. One of the best of Mexico’s handcrafts is Talavera pottery produced in Puebla. It has a mix of Chinese, Arab, Spanish, and indigenous design influences. The best known folk paintings are the ex-voto or retablovotive paintings. These are small commemorative paintings or other artwork created by a believer, honoring the intervention of a saint or other figure. The untrained style of ex-voto painting was appropriated during the mid-20th century by Kahlo, who believed they were the most authentic expression of Latin American art. Iconic image of Pancho Villa during the Mexican Revolution, a publicity still taken by Mutual Film Corporation photographer John Davidson Wheelan, January 1914. Cinematography came to Mexico during the Mexican Revolution from the U.S. and France. It was initially used to document the battles of the war. Revolutionary general Pancho Villa himself starred in some silent films. In 2003, HBO broadcast And Starring Pancho Villa as Himself, with Antonio Banderas as Villa; the film focuses on the making of the film The Life of General Villa. Villa consciously used cinema to shape his public image. The first sound film in Mexico was made in 1931, called Desde Santa. The first Mexican film genre appeared between 1920 and 1940, called ranchero. While Mexico’s Golden Age of Cinema is regarded as the 1940s and 1950s, two films from the mid to late 1930s, Allá en el Rancho Grande (1936) and Vamanos con Pancho Villa (1935), set the standard of this age thematically, aesthetically, and ideologically. These films featured archetypal star figures and symbols based on broad national mythologies. Some of the mythology according to Carlos Monsiváis, includes the participants in family melodramas, the masculine charros of ranchero films, femme fatales (often played by María Félix and Dolores del Río), the indigenous peoples of Emilio Fernández’s films, and Cantinflas’s peladito (urban miscreant). Mexico had two advantages in filmmaking during this period. The first was a generation of talented actors and filmmakers. These included actors such as María Félix, Jorge Negrete, Pedro Armendáriz, Pedro Infante, Cantinflas, and directors such as Emilio “El Indio” Fernandez and cinematographer Gabriel Figueroa. Many of these starts had success in the United States and at the Cannes Film Festival . On the corner of La Brea and Hollywood Boulevard, there is a sculpture of four women who represent the four pillars of the cinema industry, one of whom is Mexican actress Dolores del Rio . Gabriel Figueroa is known for black-and-white camerawork that is generally stark and expressionist, with simple but sophisticated camera movement. The second advantage was that Mexico was not heavily involved in the Second World War, and therefore had a greater supply of celluloid for films, then also used for bombs. 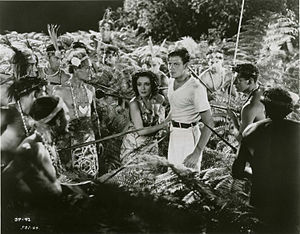 A scene from Bird of Paradise (1932) with Dolores del Río. In the 1930s, the government became interested in the industry in order to promote cultural and political values. Much of the production during the Golden Age was financed with a mix of public and private money, with the government eventually taking a larger role. In 1942 the Banco Cinematográfico financed almost all of the industry, coming under government control by 1947. This gave the government extensive censorship rights through deciding which projects to finance. While the ruling Institutional Revolutionary Party (PRI) censored films in many ways in the 1940s and 1950s, it was not as repressive as other Spanish speaking countries, but it played a strong role in how Mexico’s government and culture was portrayed. The Golden Age ended in the late 1950s, with the 1960s dominated by poorly made imitations of Hollywood westerns and comedies. These films were increasingly shot outdoors and popular films featured stars from lucha libre. Art and experimental film production in Mexico has its roots in the same period, which began to bear fruit in the 1970s.] Director Paul Leduc surfaced in the 1970s, specializing in films without dialogue. His first major success was with Reed: Insurgent Mexico (1971) followed by a biography of Frida Kahlo called Frida (1984). He is the most consistently political of modern Mexican directors. In the 1990s, he filmed Latino Bar (1991) and Dollar Mambo (1993). His silent films generally have not had commercial success. Another factor was that many Mexican film making facilities were taken over by Hollywood production companies in the 1980s, crowding out local production.The quality of films was so diminished that for some of these years,[which?] Mexico’s Ariel film award was suspended for lack of qualifying candidates. Popular filmmaking decreased but the art sector grew, sometimes producing works outside the view of censors such as Jorge Fons’ 1989 film Rojo Amanecer on the 1968 Tlatelolco massacre. The movie was banned by the government but received support in Mexico and abroad. The film was shown although not widely. [further explanation needed] It was the beginning of more editorial freedom for filmmakers in Mexico. Starting in the 1990s, Mexican cinema began to make a comeback, mostly through co-production with foreign interests. One reason for international interest in Mexican cinema was the wild success of the 1992 film Como Agua Para Chocolate (Like Water for Chocolate). In 1993, this film was the largest grossing foreign language film in U.S. history and ran in a total of 34 countries. Since then, Mexican film divided into two genres. Those for a more domestic audience tend to be more personal and more ambiguously political such as Pueblo de Madera, La Vida Conjugal, and Angel de fuego. Those geared for international audiences have more stereotypical Mexican images and include Solo con tu Pareja, La Invencion de Cronos along with Como Agua para Chocolate. Mexico’s newest generation of successful directors includes Alejandro González Iñárritu, Guillermo del Toro, and Alfonso Cuarón. Films include Cuarón/Children of Men filmed in England and El Laberinto del Fauno, which was a Mexican/Spanish production. Film professionals in the early 21st century tend to be at least bilingual (Spanish and English) and are better able to participate in the global market for films than their predecessors.